West Bromwich Albion have finally signed Paul Robinson from Watford for £250,000. Negotiations started last week between the defender and West Brom, but after prolonged discussions the deal has now been completed. The 24-year-old has agreed a two-year deal after lengthy negotiations, and the fee could rise to £375,000 depending on appearances and the Baggies earning promotion to the Premiership. Robinson is not expected to play any part in Tuesday's top-of-the-table clash with Sheffield United, but Baggies manager Gary Megson is delighted with his new signing. "We've been tracking Paul for a few seasons now," Megson told the club's official website. "He's always done well against us - including this season. We think he's a good addition to the squad who will spice up competition down the left flank. "We've also got him at a good price. I thought the fee would have been much higher for a player of his calibre." 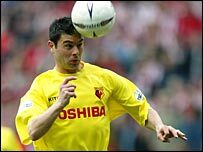 Watford-born Robinson made 252 appearances for the Hornets, scoring nine goals. Hornets chairman Graham Simpson admitted it was his decision to sell Robinson and not manager Ray Lewington's. "This offer was totally unsolicited, Paul wasn't looking for a move and we weren't looking to move him on," said Simpson. "Obviously this is not something Ray Lewington would want to do in an ideal world, but he understands the reason behind the decision, which was made by myself and the board."